This recipe was printed in The Guardian. 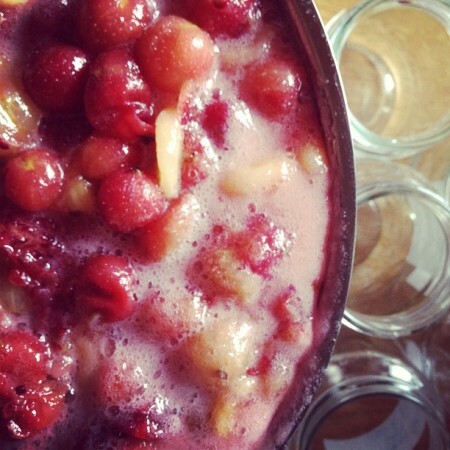 Put all gooseberries in a big pot and mash them with a potato masher. Add the sugar, bananas and lemon juice and give it all a good stir to mix it well. Let it all soak for about two hours. Heat everything gently until all sugar is dissolved – as in my photograph above. Bring it to the boil, then boil hard for 10 minutes. Then pour into sterilised jars and seal. Store in a cool, dark place and keep in fridge once opened. I’m German and first tasted this jam when I was a student, thanks to my boyfriend’s mother. He was from a country family with a big garden full of vegetables and fruits. Whenever we visited, we filled our bags with jars of his mother’s jam – which is where I came across the magnificent creation, gooseberry banana jam. The sour gooseberries were perfectly balanced by the sweetness of the banana. Unfortunately, our supply of this tasty jam stopped when my boyfriend and I moved to Scotland, where we split up, leaving a sour taste behind. My own parents have a garden that also produces gooseberries and I got my mum dutifully made some of this jam for me, although there was never enough for my daily consumption. However, we have converted our own garden into a jungle of vegetable beds and fruit bushes – including two gooseberry bushes. So these days I create my very own and quite different jam as I never got the original recipe. And I guess it is too late now. 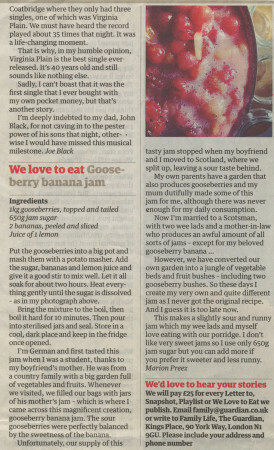 This makes a slightly sour and runny jam which my wee lads and myself love eating with our porridge. I don’t like very sweet jams and I therefore use only 650g jam sugar but you can also add more sugar if you prefer it sweeter and less runny.